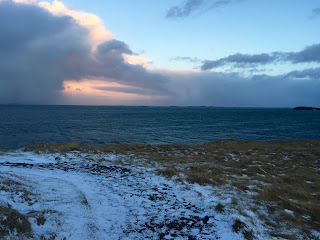 Day 3 of the Iceland trip in January was a long one! We woke up really early and trucked it to Stykkisholmur. We could have just stayed at the cabin all morning until our tour of Langajokull glacier, but really no point in just loafing around-THIS IS ICELAND! We got to see the mountains and village during the day, have lunch and then head back south to make our tour. It wasn't the best trip chain but we really didn't have many options as our tour had been moved back a day because of the storm that had hit the day before. Luckily, we got familiar with the route when the sun was up because after the glacier tour, it was pitch black and we got stuck in a white out. Yes. A white out. In the dark. Safe, right? Really wish I had more of the pics from my camera from this drive-thieves in Phoenix, man. Windiest place ever! I lost a glove and somehow Pooks was able to run it down without falling off the top of this cliff. ^ The restaurant that hosted us when we got in SUPER late from the glacier tour and fed us some of the most amazing food ever. We had the best conversation with our server too-a Icelandic girl named Hjordis. You can follow her on Instagram @hjordix. We talked about the difficulties of being vegan in a country NOT known for their produce, travel, photography, politics, and non-gender discriminating day cares-she used to work at one. She even gave us a list of a few things to do in the morning including the volcano museum that her boyfriend runs. Bernaise burger in Stykkisholmur. Nom nom nom. This is a glacier monster truck. Originally, it was used to haul 6 missiles in Poland. They bought it and brought it over and converted it for these tours. 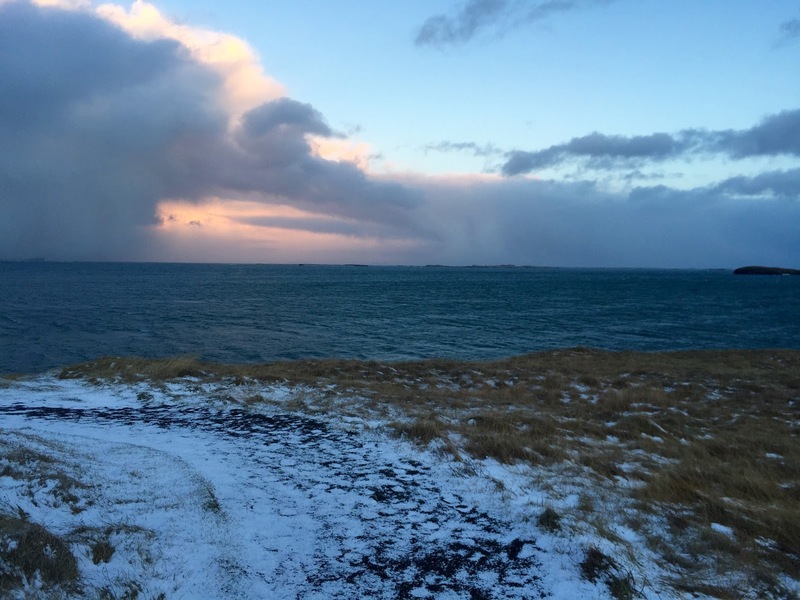 Turns out 70% of Iceland is uninhabitable. These Ravens can't even survive on the desolate land that surrounds the glacier-they follow the glacier monster truck for scraps but fly out afterward. We got stuck in a snow storm on the way up and it only got worse-complete white out. Apparently the driver follows bamboo poles in the snow and the feeling because sometimes the visibility is 0. Inside the glacier. There's a chapel and people do get married in there. Great acoustics-our guide apparently was also a singer and to be honest, she was incredible. She sang an Icelandic folk song for us in the chapel-WISH I'd recorded it. Inside Langajokull Glacier-largest glacier in all of Europe. This walkway was built across the crevasse so you could a. get out of the glacier and b. see into it. This is the view looking down the length of a crevasse. You could look up also but you have no idea where it ends either direction. Very Vertical Limit. After Langajokull we got back on the glacier monster truck and they gave us Icelandic donuts and warmed chocolate milk boxes. Our Airbnb host cancelled at the last minute because she got sick so she booked us in the nicest hotel in town! How nice of her?! Turns out it's one of the nicest boutique hotels in the country-much MUCH appreciated, mama. How hyggeligt was our little bed nook in the attic of this old home?! It was SUPER cozy, love that it actually fit two people (lots of single beds in Scandiland) and the locally harvested/woven wool blanket was an amazing touch! Our room was so toasty (once again, their heating is cheap and their buildings are well insulated) we actually slept with the window open! Scandiland doesn't really do bath tubs-showers everywhere and unlimited hot water due to all the natural geothermal-heated water. You'll probably never see a water tank for any toilet in Scandiland-they're all hidden in the walls because they're not aesthetically pleasing-I get it, I love it-but I also wonder how difficult it is to fix toilets. The view from our amazing, cozy little room. Even the window pull/openers are Scandidorable. The world's best blow dryer-I actually came home and ordered one from Amazon after some major hunting. The lobby of our adorable hotel. Fun fact-the staff does every job. The guy who checked us in at night also prepped the foods for breakfast and the servers ended up being the maids too. Economical! That being said, nicest staff and the best breakfast we had in Iceland probably. When we checked in that night, the kid running the place was listening to the Allman Brothers and Ray Charles. Nothing like a little taste of home, ha! ^This building is where they filmed the bar scene in Walter Mitty-the outside only. It was painted just for the movie, if you were questioning the color. I have an awkward obsession with Scandi cityscape cutouts. Give me all the cut outs! Overall, great day and Stykkisholmur became one of my favorite cities in Iceland, mostly because the people were so incredibly nice but also the food was some of the best we'd had in the whole country! More Iceland pics coming soon!